Ducky’s Real Life Adventures by Robbin Joanna Scott is an enlightening story that shows how some mothers may reject their young when they disobey them, even if it is accidental. Ducky is informed of this by his mother and tries his best to keep up with her and the rest of the brood at all times. On an outing, Ducky inadvertently gets stuck and is rescued by two young ladies who take him home to care for him. They attempt to return him to his family, but as promised, his mother rejected him for his disobedience. The two young ladies rescue Ducky again and help him realize what love and friendship is really about. 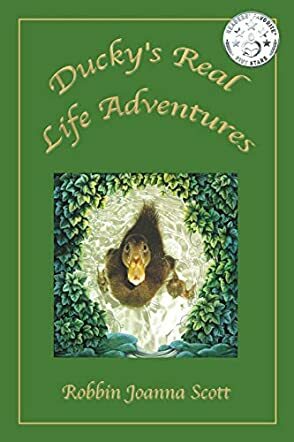 Ducky’s Real Life Adventures by Robbin Joanna Scott is a wonderful and guiding story that has a well structured and delivered story line. The plot is simple enough for young children to enjoy and learn from. Robbin Joanna Scott provided plenty of pictures that lend a meaningful brilliance to her authorship. Her writing skills are remarkable, truly a five-star story in practically every aspect. The reference at the end allows the reader to see the likeness of motherly teachings to the protection from human trafficking. An absolutely brilliant way to let youngsters know that while trust is earned, danger still lurks in some hidden places. Robbin Joanna Scott is a very talented author whose work I would happily add to my own child’s collection of story books. I would recommend this story to any parent, guardian, or even a child looking for something meaningful and entertaining to read.